Get the latest Pennsylvania Lottery Results! All games from PA Lotto! This is the ultimate Pennsylvania lottery results app! The only app you need for everything lottery related! Easily get all lottery results and lotto winners all in one place. Results and winners from every single state lottery imaginable all at your fingertips! Get access to all lotto games like Powerball Lottery, Lotto America, Mega Millions, Pick 3 results, Pick 4 results, Cash 3, Play 3, Daily 3, Pick 5! - Save your favorite lotto numbers for any lottery game! - Pennsylvania Lottery predictor & generator for Cash 4, Fantasy 5 and more! - PA Lottery analysis & lotto statistics to help you win the lotto! * This is the one our most asked for Pennsylvania lottery features. Get the most accurate Pennsylvania lottery predictions and lotto generator! 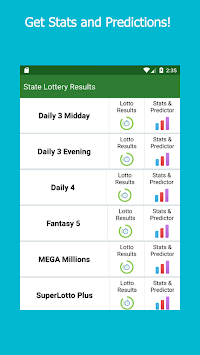 We use lotto algorithms, past winning numbers, lotto statistics and analysis to give you the best lottery predictions and number generator to help you improve your odds of winning the lottery! * The most powerful lottery app feature! Helping players win the lottery! 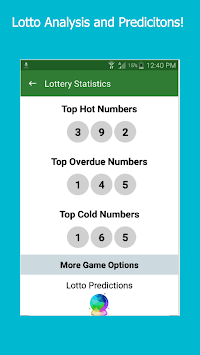 * You can get detailed lottery breakdown and lotto pattern statistics, complete with algorithms that analyze which winning numbers are going to hit! * Know which lottery numbers are hot, cold, or overdue to post! * Get online lotto results statistics by any number of draws to get accurate and powerful information! * Check your PA lottery tickets or scan lotto games with our lottery checker! * Enter your lottery usa numbers, select the date the lotto was drawn and we’ll do the rest! We’ll help you check the last 30 days of lottery post results and let you know if you won or had any winners! You can track as many Pennsylvania lottery tickets you want! * Every lottery game results available for every lotto state! * Get ga lottery results today and updated lotto news! * Winning USA Pennsylvania lottery numbers & PA Lotto results are posted immediately when they are drawn! We try to make all lotto results accurate, but please confirm all results with you state organization of lottery for most accurate results and complete results. By downloading and/or using this app you accept that results may not always be completely up to date or accurate or the information included within the app is not completely updated.